After an early breakfast, Buffalo Tours staff will meet you in Arusha at 9AM to begin the safari. Continue on to Tarangire National Park located about 120 km outside Arusha town. This park is home to thousands of elephant which can be viewed in large herds. In the dry season, game congregates along the river having migrated from the Maasai Mara. The vegetation of this park consists of open acacia woodland dotted with many baobab trees. Tarangire is an ornithologist's paradise, offering an incredible diversity of avifauna. Leave Tarangire in the late afternoon for Kirurumu Tented Lodge. Spend the night at Kirurumu, which offers panoramic views of Lake Manyara. Kirurumu is off the beaten path and its tents are situated to offer maximum privacy. Enjoy first-class service while staying at this eco-lodge. Kirurumu uses solar energy for heating water and the floors of each tent were built from natural volcanic stone. Go on a bush walk outside Lake Manyara with the Kirurumu staff and learn about the natural environment as well as the history of the different ethnic tribes in the area. After breakfast, make the long drive to Serengeti National Park. Chat with Maasai herdsmen along the way and eat a picnic lunch. Serengeti National Park, which has been declared a World Heritage Site and Biosphere Reserve, is a vast and beautiful expanse of 5,600 square miles, which supports the largest concentration of plain game in the world. Famous for its gregarious procession of millions of wildebeest and zebra that takes place from December to August, the Serengeti attracts thousands of visitors each year. The migration offers excellent opportunities to view animal behavior due to the abundance of both predators and prey. Common animals are wildebeest, cheetah, zebra, lion, giraffe, and many species of antelope.Spend the night at Serengeti Serena Lodge. 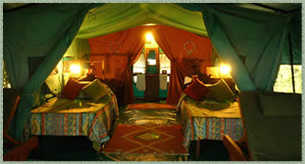 This lodge is located in the heart of the Serengeti, making it extremely easy to explore other areas of the Serengeti. After an early breakfast, go on a game drive to try to catch a big cat hunting. Eat a picnic lunch in the park. The Serengeti region encompasses Serengeti National Park itself, the Ngorongoro Conservation Area, Maswa Game Reserve, the Loliondo, Grumeti and Ikorongo Controlled Areas and the Maasai Mara National Reserve in Kenya. On day three, explore some of the remote areas of the Serengeti, viewing crocodiles, hippos and cats. Return to Seronera Serena Lodge for dinner and overnight. Spend another day in the Serengeti. Leave after a lunch for Ngorongoro Crater. Take a detour through cheetah territory before climbing the crater walls. Arrive at Ngorongoro Serena Lodge in time to view the spectacular sunset over the crater. After an early breakfast at the lodge, proceed to Ngorongoro, where a full day in the world-renowned Crater awaits. Descend over 600 meters to the crater floor, where you will view Ngorongoro's myriad of resident animals. The largest unbroken caldera in the world, Ngorongoro has an area of 260 kilometers and a depth of 610 meters. Created when the cone of an extinct volcano collapsed, the crater provides a protected habitat for thousands of mammals and birds. The entire day is spent on the crater floor viewing lion, hyena, wildebeest, zebra, black rhinoceros, and many species of small antelopes. During some seasons, the soda lake is crowded with flamingo and other water birds. You may also see Maasai herdsmen grazing their cattle in the crater.Enjoy your picnic lunch at the designated lunch spot where Black Kite birds feed on tourists' leftovers. Lunch offers an excellent opportunity to view the behavior of birds and observe the forest elephants that usually feed in the marsh near the picnic area. After lunch, you will continue on a game drive to spot the most elusive of the big game animals, rhinoceros and leopard. Leave the crater at around 4 p.m. and proceed to Ngorongoro Serena Lodge in time to watch the spectacular crater sunset. After an early breakfast, leave Ngorongoro for Lake Manyara National Park. The park is close to Ngorongoro and encompasses Lake Manyara and its surroundings. Lake Manyara, a Rift Valley chain lake, is nestled at the foot of a spectacular 650 meter escarpment and is surrounded by a lush tropical forest filled with towering mahogany and fig trees. During the game drive, you will visit the park's five different vegetation zones including groundwater forest, acacia woodland, open areas of short grass, swamps, and the lake's alkaline flats. Lake Manyara is home to more than 350 species of birds and visitors can expect to see baboon, giraffe, hippopotamus, elephant, and buffalo. You may also glimpse Manyara's famous tree-climbing lions. Leave the park in the afternoon to return to Arusha. On the way back, we will stop at local markets and curio shops will promise a glimpse into village life and also offer an opportunity to purchase souvenirs. After reaching Arusha, Buffalo Tours staff will assist you with your travel plans.